Humans depend upon high levels of ecosystem biodiversity. But due to climate change and changes in land use, biodiversity loss is greater now than at any other time in human history. 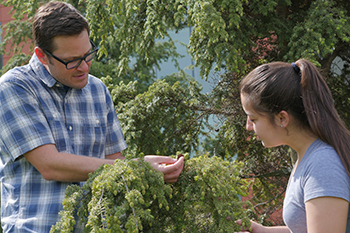 Jason Fridley works in the Climate Change Garden with biology undergraduate Paige Armas. Jason Fridley, associate professor of biology in the College of Arts and Sciences, has co-authored a paper on the subject in Science (American Association for the Advancement of Science, 2015), the world’s leading journal for original scientific research. Fridley is part of an international research effort, led by Lauchlan Fraser, a community and ecosystem ecologist at Thompson Rivers University in British Columbia, Canada. The team’s findings point to a link between plant biomass and species richness in grassland ecosystems. The results of these findings have global ramifications for the management and conservation of biodiversity. For their paper, “Worldwide Evidence of a Unimodal Relationship Between Productivity and Plant Species Richness,” Fraser and colleagues designed an experiment, involving over 60 scientists from 19 countries on six continents. He describes the effort of collecting and analyzing the data as “Herculean.” This project is part of HerbDivNet, a network of scientists who study relationships between plant biomass production and species diversity. Fridley, a plant ecologist who helped design Syracuse’s new Climate Change Garden, says implications of this study may be seen amid the rolling pastures of Central New York. He offers up the example of a dairy farmer, for whom managing a pasture is no easy chore, between maintaining high plant production for one’s cows and high biodiversity of plants in the field. Managing ecosystem productivity is one possible solution to regulating diversity, but it has long been a subject of debate. This new research is groundbreaking, in that it reaffirms a previously held theory of biodiversity, but it also challenges a four-year-old article in Science that all but disproved it.